Well, believe it or not, I'm getting a few more spring blooms! And we'll get to them in just a minute. Really. But first I must tell you that (are you ready?!) I have my first winter-sown seedling babies!!!!!!!!! (Please excuse all the exclamation points, but I'm just so excited and I figure they still beat the dreaded all caps!) I am proud to introduce you to catchfly (Silene armeria 'Carmine Pink') and lupine (Lupinus polyphyllus 'Russells Prize Mix'). 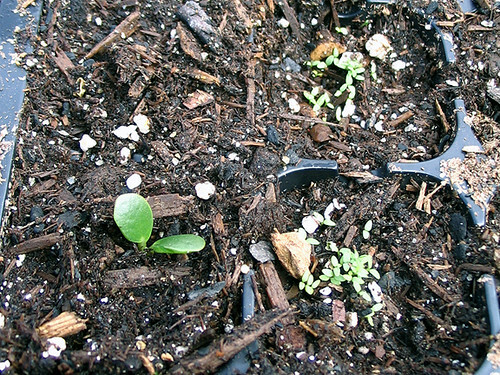 The former are the eeny beeny, teeny tiny, itsy bitsy seedlings, and the latter is the larger seedling. Noogie noog, they're so cute! These are both perennials that must be fairly hardy. We haven't had any kind of crazy warm spurts, so they are coming up on their natural schedule. It may snow overnight, but they will be fine in their little winter-sowing containers (they're in the top row, second from left--wave hello!). Nothing else, by the way, is crazy enough to be up yet. And now on to other treasures blooming in the garden! We have the happy, warm sunshine-yellow of crocus. We have some more lemon-yellow aconites. Noogie! Here we have a lovely and vibrant dwarf wild iris (Iris reticulata). We have one solitary, but oh-so-lovely, snow drop. And (drum roll, please) we welcome a hellebore into the garden!! Isn't she a beauty? I bought her today at the Ann Arbor farmer's market (which tends to be a bit pricey, but I needed eggs)... so there I was, minding my own business, trying to find the nice egg lady when I pass a bunch of hellebores. This plant has been on my in-the-back-of-my-mind wish list for at least a decade, but I somehow never managed to get one. Then I saw so many gorgeous ones blooming in all your blogs, and I was committed to get one! And here she is, waiting to be planted. In case you are wondering why there are only one or two of many of my blooms, allow me to show you my tulips. As evidence of some kind of nibbling critter. This same pest also ate most of my crocuses, many of my dwarf wild irises, and probably some of the snow drops. Fortunately, it has so far (knock wood/toi toi toi!) left my daffodils and hyacinths alone. You may recall my sundry travails with the groundhog. I always blamed him/her/them for this yearly destruction, based on the other things I actually caught them in the act of eating. But, as hard as this is to admit, I may have been wrong about that. You see, the groundhog is still hibernating. I always see the groundhog once it's active and I haven't seen it yet this year. So I'm going to guess it may instead be rabbits. Granted, I haven't seen them either, but they're a bit skittish, being lunch for so many other animals. And they don't hibernate and must be pretty hungry for greens this time of year. Or, it could be squirrels, but they seem to do pretty well at my feeders and they tend to dig. These plants were chewed off and/or yanked out, not dug out. I'm not going to harm whatever animal it is, I'd just like to know. And, bananas! Last spring I swore I wouldn't buy any more bulbs and then in fall I promptly forgot and bought a bunch from Old House Gardens. Short memory, must have a short memory...(Yolanda, that's queuing Midnight Oil for you, right? Just re-listened and 26 years later, it's still good and still relevant!). Added 3/29: Since yesterday, the tulips have been chewed down even farther, and the culprit had been identified — it was a groundhog! Today as I was looking out my front window while chatting on the phone, something caught my eye while moving along my front walkway. Right in the area of the devastated foliage, I might add. I glanced casually outside, expecting to see Fiona. It wasn't Fiona, but a darker brown animal. At first I thought it was the annoying unneutered cat that comes around from several houses over, but it wasn't. My brain couldn't actually process what I saw right away, because I so very much wanted to see a cat that I was a bit in denial. But, alas, yes. It was the dreaded member of the Sciuridae family, the Marmota monax, the groundhog, which scuttled away by the time I reached my camera. Banana bites! OK, I know it's hungry after hibernation and bulb foliage is one of the few green things up. Fine. But does it have to rip off the crocus flowers, strewing them across the beds, before eating the crocus foliage? If it doesn't like the flowers, couldn't it at least have the decency to bury the evidence somewhere? I mean, it's one thing to process and accept chewed off foliage, but beheaded crocuses just add insult to injury. I ask you!!! Thanks also to Mr. McGregor's Daughter and Frances who both pointed out that when I typed "Siberian iris" I really meant "dwarf wild iris" or "Iris reticulata." I do indeed have Siberian irises, but of course they're taller and bloom later, as well as bearded irises, which bloom later still and wouldn't really be confused with either of the former! You must be so excited Monica to see your seedlings emerging :) Glad to hear that a hellebore managed to land in your shopping basket at the market - you will not regret it - you have chosen a beauty there ! Congratulations on your new babies! they are truly little cuties. You will let us know their progress won't you? I love the hellebore! This one is a beauty and she has her head more upturned than lots I have see. More congrats are in order. I have some tulips that look just like yours. I'm sure it's rabbits. I don't think it will hurt the flowers as long as they don't chew them to the ground. I'm proud of you, Monica! My little incubators aren't coming up with anything, yet. Guess I still have time, but it would be nice to see one sign of life! ha. We've had snow this afternoon. It looks as though it's slowing down... at least for now. It's warm enough (33degrees) that I assume it won't last long. Hope everything is okay out there! Hello, pretty bulbs! And shoo, bad little rabbits or squirrels! Good to see some blooms finally coming to your garden, Monica; I can't blame you for being excited. And I can understand being enticed by that hellebore. They've been on my wish list since last spring. Yours is a beauty. I am going to have to read your book about winter sowing. These seedlings growing out in the cold just amaze me. Good to see that Spring is finally coming to business at your place. And this unidentified critter means business too - how mean to nibble off those long-longed tulip blooms! Oh, and the seedlings: Doble YAY! Applaus! Lovely, Lovely flowers. My favorites are: Siberian iris and hellebore. Thanks for posting those pics. A joy to my eyes. Monica: Hurray Spring has sprung in your neighborhood!! Yippee! Lovely blossoms in your garden! Well it just popped up fast didn't it? Yahoo! Aw, the babies are adorable Monica! Congratulations on your first hellebore - she's a beauty! Be careful now, they're addictive! Rabbits used to eat the buds off my tulips all the time. I gave up on planting them since just before the buds were about to pop I'd a few little shredded petal remnants on the ground. I caught them in the act all the time, and they didn't stop until they ate the last one. They never chewed them down like that though - just ate the bud, left the stalk. Thank you--Helly is a beaut! She was fairly expensive, too, but I figured since she was locally-grown and already blooming (plus I noticed a few stalks that had already bloomed had been cut off, meaning she has a strong root structure and is a mature plant), she was worth it. The soil, even in the winter-sown containers, isn't warm enough for most plants to emerge yet. I think perennials in general are a bit hardier and these two must have cool germination temps. No one else in all my containers is up yet. Everything comes up on its own schedule in winter sowing--I guess catchfly and lupine are just hardy--I would have expected it from the latter but not the former. I sowed bee balm one year and it was up this early or earlier. Though I'm a ridiculously light packer/traveler, I will have a few copies of the winter sowing booklet with me in Chicago if you're interested! The hellebore cost more than I normally pay for a perennial, but she did seem mature and obviously has done well in my area. I also really like the freckles and color--he had a few more pale shades to choose from and some without freckles. I do love the close-ups of small flowers. I really lean toward the snowdrop--I love the little bit of green "lace"! I've only seen deer twice in the nearly 7 years I've lived here, but I suppose I can't rule them out. Oh, we crazy gardeners love to strike up conversations at the nursery. I often pipe up if I hear people wondering out loud. Given their cost, I can see how hellebores could form a bad habit (like crack!). Yes, even shady places can have bulbs because trees aren't leafed out yet. It's just if you have critters that you'll be frustrated. Tulips seem to be most eaten, and they also have a fairly short life cycle in general... maybe THAT's the bulb I meant to avoid (and did!). And I think I'll plant more aconite as they seem to be left alone as well. Wow liebe Monica, Du hast ja fleissig ausgesät. Und der Frühling scheint bei Euch eingekehrt zu sein, nach all Deinen Blüten unschwer zu erkennen. Für die Baldrian-Kissen nimmt man wohl das getrocknete Laub der Pflanze. Unsere Katzen sind absolut verrückt danach. Viel Spaß beim Nähen. I'm just drooling over that Hellebore! If you have to have only one, that's definitely a good one to have. I think your little Iris is a reticulata, one of the early spring blooming bulbous types. If you are finding your plants munched overnight, the culprit is probably either a rabbit or a deer, with the deer being more likely. Rabbits tend to cause damage more during the day, although squirrels will chomp things too. Try spray on critter repellant. Bananas and bites together on this one, Monica! The sight of those vandalized tulips makes my engine roar in disgust! But on the other hand, the blooms, your new hellebore, are you sure that's not Iris reticulata? and joy of joys, baby winter sown seedlings popping up are cause for happiness. I have been saving the clear jugs from the orange juice to try it next fall. AND, sorry for the caps, the Eryngium yuccifolium is up and thriving. Just like you suggested, placing the seeded pots outside in the cold was just the ticket! Thanks so much and so sorry for your losses. We use a lot of chicken wire here, but see the radishes were ravaged for a third time, even with the chicken wire on top. Glad to see all the beautiful flowers are blooming in your area. Have a wonderful weekend. Yep, it's now snowing here!! And of course you are right about the iris I inadvertantly called Siberian--it is indeed Iris reticulata. I do have Siberian iris as well, but they're taller and bloom later. I also have bearded iris, which bloom later still. Thanks for stopping by and explaining your blog name. I love your photos! Glad your rattlesnake master is up--you will love it! And, in case you were wondering, it's SNOWing now. And, yes, you are indeed right that I mistyped/misthought... I did in fact mean Iris reticulata, not Siberian iris. DOH! I've also tried chicken wire and it didn't help much, though it did take a long time and scratch ME! You would think my cats might be a deterrent, but they're not. But I've never had THAT MANY nibbled off at once by a squirrel. For all the $$ we spend decorating our gardens, we lose a lot, don't we?!?! But for all the frustration, there is also so much joy!!! Hi Monica. I am so disappointed in myself. I had planned to winter sow last year but didn't. I thought things would be so late germinating. I was wrong. I will begin now collecting trays and tables to be ready next winter. Do you have large holes in the tops of your tray covers? Monica, I'm taking your advise and planting a few jugs and maybe a tray. What do I have to lose but a few seeds. A shady or semi shady place right? My tulips look much the same although I have a deer problem. Looking forward to meeting you at the Spring Fling! We don't have groundhogs, what do they look like??? Ha ha - great post Monica, you really made me chuckle with the groundhog story! We don't have groundhogs here in the UK, but I do have a bit of a problem with the squirrels, foxes and badgers that live around my garden! I love the dwarf wild iris and the hellebore - lovely colour! I know he groundhog is hungry, but it's still frustrating! This is my fifth season winter sowing, and I love it. I don't start seeds indoors any more at all. It's not to late to winter sow quite yet in your area (or mine! I need to sow some castor beans today!). I use a drill with a 3/16" or 13/64" drill bit to make the holes. Thanks for stopping by! It was nice the Spring Fling blog posted all people attending--I'll be stopping by the others blogs to say hello, too. Badgers are kind of like groundhogs in size and shape. I have lots of squirrels, but they dig up my awn, not eat foliage. I've only seen a fox once at the edge of my yard... I guess everyone has different wildlife friends and enemies! Monica...such bounty you will have this spring/summer! Something ate the buds off my Northern Lights Azaleas! I am pretty sure it was squirrels...they have been incredibly aggressive. They climbed on the kitchen window screen, pounded on the patio door...I know they want food! You have so many plants already! And I love your excitement about the seeds, I have 2 little seedlings appearing and I got all a-flutter! Ja, die lieben Wildtiere. Ich sehe sie sehr gern, solange sie meinen Garten in Ruhe lassen. Die Eichhoernchen lassen zumindest die Narzissen in Ruhe - die Tulpen verschwinden aber schon nach einem Jahr ganz schnell.